San Diego Medical Marijuana Co-ops Raided Again! "Drug War Chronicle is one of the first resources I suggest to new students getting involved in the drug policy reform movement. There's nothing else out there that covers a wider variety of drug war issues each week. SSDP loves Drug War Chronicle, keep up the great work!" "On behalf of California NORML, I strongly recommend the Drug War Chronicle. DWC consistently provides the most comprehensive, reliable, in-depth coverage of drug issues for the reform community. When Phil Smith calls me, I know that he will accurately report what I have said. DWC is a valuable resource, and I often consult its archives for background research on issues of interest." "I read Drug War Chronicle assiduously in order to be up to date on the failing drug war." "When I was a high school student researching online for a paper I was writing, StoptheDrugWar.org was one of the first sites I found, and I've read its Drug War Chronicle newsletter avidly for well over a decade. Subscribing to the newsletter allows me to get up to speed on all the important issues of the day, learn about the players, and take action. Most crucially, I found out about Students for Sensible Drug Policy there, and started going to conferences. Drug War Chronicle was a gateway drug to a life of being addicted to drug policy reform -- I am involved in drug policy reform as a full-time activist basically because of it. Since then, the Chronicle always been welcoming of the commentary the organizations I've worked with -- SSDP, LEAP, Marijuana Majority -- are trying to push. StopTheDrugWar.org is very helpful in getting the message out to the base so we can keep people informed and give them opportunities to take actions that will change the drug laws." "As part of a small staff without any single staff member devoted to research and policy, Drug War Chronicle is one of the most useful resources I have to stay on top of important developments across the country. I direct a nationwide speakers bureau, and whenever I receive a request from a state I'm not familiar with, one of the first things I do is search my Drug War Chronicle email folder to get a clear summary of the latest updates from that state. Then I am able to confidently bring the speaker up-to-date and help him/her prepare to do a talk that is not only persuasive and credible, but also informed on the current local context. If I didn't have the DWC I'd have to do endless online research and still never be quite sure if what I have is up-to-date. We also encourage all of our speakers to subscribe to stay on top of the most important updates on a weekly basis." "We have appeared regularly in Drug War Chronicle, always correctly and in your wonderfully clear American-style journalism. We know Drug War Chronicle is read by many people who appreciate correct and well-presented information on drug policies around the world. So of course we are happy when our events get covered. Drug War Chronicle is a must for everyone who wants to keep up to date with the slow but steady revolution we are witnessing in drug policy worldwide. True quality does not need promotion: continuity, accuracy and precision are its trademark. Many thanks to David, Phil and the rest of the team!" "Drug War Chronicle serves a uniquely valuable purpose. It is original hard-hitting reporting that isn't skewed to the perspective of one drug policy reform group's perspective. When I tell people what is happening broadly in drug policy, I am mostly telling them what I read in Drug War Chronicle. Every week our views are challenged by the conventional wisdom -- it is an immediately relevant refresher on the big picture of why I get up every morning... to end the human suffering caused by drug prohibition. If Drug War Chronicle were to disappear, the obvious tangible value it brings would be lost. But one thing that might be overlooked is the inspiration it gives to people fighting the good fight and the morale boost that happens when people realize that great work is being done on this front by people of conscience all over the world." "Before I started Colgate University's chapter of Students for Sensible Drug Policy, I would stay up to date on issues in drug policy by reading stories in Drug War Chronicle. The information I gained familiarized me with the growing movement for drug policy reform and stoked my passion to actively change our nation's unjust policies. As leader of the chapter I used StoptheDrugWar.org to keep myself informed and to teach other students about the most up to date drug policy issues both within the United States and abroad, and in my own research on how illicit drug markets operate around the world. Since my graduation, Drug War Chronicle has helped me in my work at the Criminal Justice Policy Foundation, on the Colorado Amendment 64 campaign, and now at the law firm of Vicente Sederberg in Denver, where I advise the state of Colorado on implementing marijuana legalization." "Drug War Chronicle has, for years, provided a vital and unparalleled source of rational, fact based analysis on the US Drug War for readers in the UK and Europe. Congratulations to the team are fully deserved; when the Drug war ends, the role of the Chronicle in its downfall will not be forgotten." "Oaksterdam University has long enjoyed sharing the information compiled by Drug War Chronicle with students of the History of Cannabis and Marijuana Prohibition. DWC excerpts are informative and helpful to our Legal, Politics & History classes, as well as Civics, Dispensary Management and Operations, and Advocacy courses. One of the most important services we provide is the ability to bridge to sources of good information, and I have long considered you one of our vital resources. It is simply one of the most comprehensive sources I direct my students towards. Your website and communications are a cornerstone of our Political Science department, and provide important lessons for anyone involved with Cannabusiness or drug policy reform." "The West Coast Leaf always looks to Drug War Chronicle to help us determine the most important stories for our newspaper. Its in-depth coverage is top-notch, providing a well-rounded perspective on the news, along with quotes from drug policy's doers and shakers. At times, we use the stories as well (with all due credit) so the impact of the Chronicle is amplified in print edition. It's a vital resource in activating the masses with relevant information needed to make reform happen." "Drug War Chronicle is essential reading, a breath of fresh air. The mainstream media doesn't always get it right. Chronicle stories are thorough and comprehensive. I especially like the analysis and commentary. There's always something so newsworthy in the Chronicle that I pass it on to my listserv -- every week." "Great article -- thanks, because this text is now a weapon in our hands! I just received an email from the director of the Portuguese Drug Institute, applauding our critic spirit and frontality. I need to ask you if I can publish your article in a Portuguese cannabic newspaper in which I am a collaborator. We are in a hurry because we lost one colleague and your article is perfect for the actual Portuguese scene!" - Jorge Roque, Portuguese activist, referring to our article about a report that highlighted Portugal's successful decrim policy, but with our article also discussing the need for further reforms. "I used to be a volunteer staff member on a harm reduction forum, which has a 'Drugs In The Media' section. On here I, as well as many other members and staff, would post from and link to new and old articles from Drug War Chronicle. It is an invaluable resource for current and former drug users and addicts who are seriously concerned for their health, safety and legal status. News that has a positive or negative impact on the community of Harm Reduction proponents and recipients often comes from Drug War Chronicle first- and if not first, it is the place where we can easily find it. It's a resource we sorely need. Good luck with securing proper grants, I hope you can continue putting out the same quality of content as always." I've been a programmer at KZYX Philo and KKUP Cupertino since the 80's, and find the information which you provide to be extremely valuable to our listeners. I read as often as possible, and when relevant forward information to hundreds of activists in Kentucky and elsewhere. "Six years ago, I broke a ten year addiction to heroin and cocaine with the realization that the prohibition laws and their enforcement had been far more damaging to me than the drugs I had used. Drug War Chronicle has been an indispensable resource for me, a source of verifiable, factual information, news and statistics about the reality of prohibition that I have been able to rely on when speaking with groups and individuals in my city. I recently started my new career as a substance abuse counselor at a methadone clinic in Vancouver." "Drug War Chronicle is absolutely the best way to keep abreast of the issue. It's just a phenomenal resource -- full of interesting stories and links." "I've covered the drug story for years, in many places and on many levels. Your coverage of the drug scene has been a vital resource for us. You provide a continuous flow of information that isn't available from any other media source." "I am an active member of my geographic community serving on my county's Substance Abuse Advisory Board and Substance Abuse Prevention Association. I also serve as the community co-chair for the Washington State HIV Prevention Planning Group. I have used information from the Drug War Chronicle to bring others in my community to recognize the need for drug policy reform. As a member of the Substance Abuse Advisory Board I have been able to have materials circulated to all members of county government." "I use Drug War Chronicle as a source for information I disseminate to the chapter -- local members use the information in conversations and more formal talks about drug policy, as well as in letters to the editor." "Drug War Chronicle has been an invaluable source of information to us as far as keeping up to date on all of the latest issues surrounding addiction and drug policy. I read every issue as thoroughly as I can, and reprint and pass along many articles to my colleagues and associates. 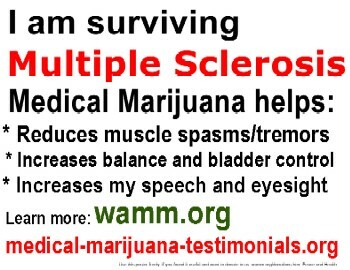 I also have used it in my monthly meetings and in Patient run support groups." "Our work is well known in Brazil and I serve on government committees as well as present at most of the conferences here. Drug War Chronicle has been a major source of information and has helped shape our treatment programs as well as influenced many policies and conferences, where the only other sources have been the official USG and UN policies." "I am a university professor who teaches a criminal justice course concerning drug use/abuse trends, law enforcement issues, etc., and find the Drug War Chronicle an up-to-date source of solid information useful to me and/or my students. Even if one may disagree with some of the views presented, the Chronicle obviously tries to get the facts straight -- and does. It is an extremely valuable resource." "I use your information to keep abreast of drug laws and initiatives and inform clients, prisoners, and prison activists. You provide a very valuable service for those involved in criminal defense and those assisting prisoners in appealing unjust sentences and convictions." "You are the best source of information about drugs policies on this continent and your work is crucial!" - A European drug policy activist. "Hell yes I read you guys... keep it up. I tell everyone I know about your site." An estimated 300 people attended The First Latin American Legalization Summit, or Out from the Shadows Mérida, at the Autonomous University of the Yucatan in Mexico, February 12-15, 2003, including Mexican activists, national legislators and advocates throughout Latin America, Americans, Europeans, and numerous students and interested members of the community -- an historic, first of its kind, global summit calling for and end to drug prohibition. Though the event's primary focus was on legalization, the coca issue was also dealt with extensively. Among the important leaders from the cocalero movement were Felipe Quispe of the Bolivia Parliament and Nancy Obregon of Peru. Other events in this international legalization conference series included an institutional two-day event at the European Parliament in Brussels in September 2002 and a press conference with Canadian Sen. Pierre Claude Nolin in Washington in April 2003. This program is currently inactive due to lack of funding. If you are interested in supporting an international legalization conference, please contact us! Seed costs for the next conference should be in the neighborhood of $50,000US. Please view video footage and photographs from Mérida online! Our thanks to Jim & Ellen Fields of Eclectech Media in Mérida, and to Radio Radicale, for their outstanding work documenting this historic event, as well as Jeremy Bigwood for photography. View or listen to Eclectech video or audio of most of the conference, English and Spanish versions available. Visit Radio Radicale for video as well as interviews from the conference, in the original language of the presenters. Click here for further background on DRCNet and Out from the Shadows. The West Hollywood, CA, City Council voted Monday night to approve a resolution calling on Los Angeles County sheriff's deputies to not "target adult marijuana users who consume this drug in private and pose no danger to the community." Although it is nonbinding, the resolution sends a strong message to LA County Sheriff Joe Baca about how the city of 35,000 wants its laws enforced. West Hollywood now becomes the first Southern California city to adopt a "lowest law enforcement priority" measure toward marijuana similar to Oakland's successful 2004 Proposition Z initiative. But it may not be the last this year. Similar "lowest priority" measures are slated to go to the voters in Santa Barbara, Santa Cruz and Santa Monica in November. The resolution was introduced by Councilman John Duran, and passed on a 4-0 vote. Duran and the council acted after local activists organized in the West Hollywood Civil Liberties Alliance filed a petition to put a lowest priority initiative to the popular vote. Given that city officials viewed LA County Sheriff Joe Baca as already not making marijuana law enforcement a high priority, and fearful of costs and "inflexibilities" associated with a ballot initiative, the council agreed to address the issue via a resolution after consulting with the Alliance. The resolution says "be it resolved that the City Council of the City of West Hollywood hereby declares that it is not the policy of the City or its law enforcement agency to target possession of small amounts of marijuana and the consumption of marijuana in private by adults." "Marijuana, you know, a joint or two is just so far down on the scale it doesn't seem worthwhile to allocate any sources to the enforcement of the marijuana laws," said Duran. "We've seen that marijuana use is certainly no more dangerous and destructive than alcohol use," Duran said. "The whole 'reefer madness' hysteria has worn thin." While Sheriff Baca and his deputies may not be prowling West Hollywood for pot smokers, the agency is unsurprisingly not happy to be told how to do its job. Some Sheriff's Office officials were among the few public opponents of the resolution, and City Councilman Joe Prang, who is a high Baca advisor, abstained on the vote. But Baca was being politic Monday afternoon. "We certainly in my office understand what pressure is," he told the Los Angeles Times, suggesting city officials were besieged by pot legalizers. "My belief is that the city needs to have its voice heard on the matter, and the question will remain to what extent is this resolution binding. We will look at it for all of our pluses and minuses and advise the City Council as to our position." If the department decides it will not comply with the resolution, the city could terminate its $10 million annual contract to provide law enforcement services and seek another department to replace the Sheriff's Department. But that is unlikely, Duran told the Times. "That would put us in an awkward situation," he said." Drug War Facts -- an important resource used widely in "the movement" -- is an extensive compilation of quotes, stats, charts and other info dealing with more than 50 drug policy topics ranging from economics to needle exchange programs to the marijuana gateway theory to environmental damage in the drug war, drug policy in other countries, race as it plays into drug war issues, even a "Drug Prohibition Timeline." Whether your goal is to improve your understanding, add force to your letters to the editor or prepare for a debate or interview, Drug War Facts, a publication of Common Sense for Drug Policy, is a valuable if not essential tool. 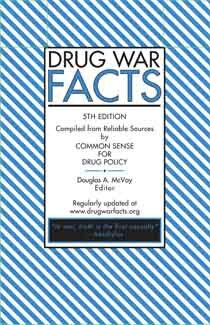 The 5th edition of the convenient print version of Drug War Facts is now available. Donate $17 or more to DRCNet, and we will send you -- or your specified gift recipient -- a copy of Drug War Facts. Or, donate $25 or more for Drug War Facts AND the essential DVD video Law Enforcement Against Prohibition.Please visit http://stopthedrugwar.org/donate/ to make your donation and order Drug War Facts 5th Edition today -- consider signing up to donate monthly! We continue to offer the new DVD from Law Enforcement Against Prohibition (LEAP). As Walter Cronkite wrote in a testimonial for the video, "Anyone concerned about the failure of our $69 billion-a-year War on Drugs should watch this 12-minute program. You will meet front line, ranking police officers who give us a devastating report on why it cannot work. It is a must-see for any journalist or public official dealing with this issue." DRCNet's ability to get the word out about important tools like Drug War Facts and the LEAP DVD depends on the health and reach of our network, and that depends on your donations.Please consider donating more than the minimum -- $50, $100, $250 -- whatever you are able to spare to the cause.The cause is important -- as former Seattle police chief Norm Stamper expressed it in the LEAP video, "The Drug War has arguably been the single most devastating, dysfunctional social policy since slavery." Again, our web site for credit card donations is http://stopthedrugwar.org/donate/ -- or send a check or money order to: DRCNet, P.O. Box 18402, Washington, DC 20036. (Note that contributions to Drug Reform Coordination Network, which support our lobbying work, are not tax-deductible. Deductible contributions can be made to DRCNet Foundation, same address.) Lastly, please contact us for instructions if you wish to make a donation of stock. Thank you for your support -- we hope to hear from you soon. Special thanks for Common Sense for Drug Policy for making these important resources possible.